To achieve the deepest fulfillment of our highest calling, our souls’ goals compel us beyond the pragmatic intentions of ordinary goal-setting. In other words, we must “Overcome the Otherwise”. To accomplish this we will reformulate the process of goal-setting through the lens of Quadernity’s profoundly-inspired four-fold dynamical structure. You will not, however, need to have read any previous pieces on this site, or have any knowledge of Quadernity to proceed with the unique goal-setting process provided here. It is simply organized around four phrases, I Need, I Want, I Can, I Am. By discerning the subtle power of each of these phrases and carefully reorienting ourselves to employ them as well-intended, we are more able to reach our greatest good in the world. First-time readers are encouraged to read the linked asides as they come up, highlighted in purple-colored indented text. 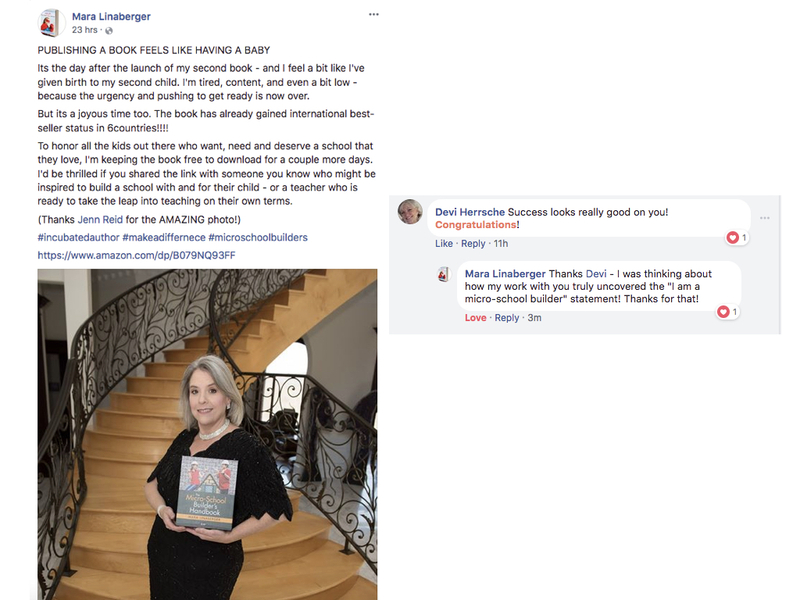 The linked material has been set aside because, although relevant and important, it will not need to be re-read each time the goal-setter wants to review the six-step process laid out below. Clicking the link for any correlated aside will open a new page. When the page is closed, you will find yourself back in the original text, right where you left off, so you can continue reading without inconvenience. We learn from Quadernity that within a quiescent, Eternally Comprehensive Perfection (explanation available at: ECP) there is a fundamental dynamic, comprising four elements, which makes possible all happenings, including learning and evolution. When uttering any of the four phrases above, we claim as our reality whatever we say afterwards, in description of ourselves. To the degree we use our words carefully, we shall earn mastery over our circumstances. Should we randomly use these phrases, as if incidental to our self-descriptions, we aimlessly dissipate our personal power. If, instead, we utilize these four phrases purposefully, we unlock our highest creative potential. With respect for the subtle profundity of these prayerful phrases we begin to unravel and reorganize our thought processes for greater clarity of purpose and enhanced effectiveness in all our practices. The presentation, Imago and the Image of God, especially in the second of its three short videos, comprehensively examines these four phrases, the correlated four developmental phases of individual life, and the four functional aspects in collective social systems. Unlike the other asides, highlighted in purple below, which are recommended reading the first time you go through this chapter, this trio of videos is entirely optional viewing at this point. If you wish to view the videos now, click on the bold link that opens this paragraph. If you would prefer to wait for another time, you can go directly to ‘Imago and the Image of God’ under Presentations, a menu title under the Quadernity masthead. In the physical sense Needs are more basic than Wants. Fortunately, our bodies prioritize getting our immediate Needs met, and only afterwards will our Wants/preferences be attended. For instance, if we are starving we Need to eat and would eagerly scavenge anything edible. When merely hungry at mealtime, we select from options what we Want to eat. If a person says to you, “I Want a bigger house,” you may ask, “What is stopping you?” They may then say, “I Need a bigger salary,” or “I Need a better credit score,” or “I Need to save for a down payment,” etc. The Need that precludes the Want is hidden behind it. To get started we will explore Wants in Step One below; then we will follow up by addressing discovered Needs in Step Two. Here we go! We begin by asking ourselves what it is we really want. Without censoring ourselves, we simply list what we want to achieve, acquire, experience, etc. Above this list we put the title: I Want. We look at our list to see if any of what we say we want is actually a relief from what we already have but do NOT want. Negating a negative is a neutral goal with defeat built right into it. Review the Aside: Neutral vs. Positive Goals and revise your list to contain only positive goals. Another irony lurks, overlooked by many well-intentioned goal-setters, and even some professional goal-setting advocates. It is the simple fact that we cannot want what we already have; we can only want what we do not have. Therefore, wanting affirms a lack. More on this in the Aside: Wanting Leaves a Lot to Be Desired. Next, we ask ourselves why it is that we do not already have the life of our own choosing, and we make an uncensored list of our presumed obstacles. This list tells us what it is we think we NEED before we can have what we WANT — a very good start. We have to face our present reality before we can change it. Title this list I Need and set it aside. Now, forgetting about our obstacles, we move into a meditative visualization in which we are living our chosen life. All that we Want is a reality. We really sink into our perfect imagining; we soak it up and engage all of our senses in the panorama. What do we see, smell, hear, touch, even taste? The more sensual cues we perceive, and the more profoundly we allow ourselves to feel whatever emotions arise, the better. While in your grand visualization, ask yourself the questions below. Do not write your answers out, which would shake off your elevated mood. How do I feel having all I desire? How do I occupy myself in this perfect life? What are my creative endeavors? Who enjoys being with me? Who really knows me through and through? What is the ambiance of my residence? What is the natural habitat of my surrounding environment? To what degree am I engaged with my local and/or extended community? How am I of service to others? When I am gone, how will I be remembered? For what purpose am I here now, living this life? What is my unique gift to deliver? How do I serve the greater good of All? This exercise sheds light on the true purpose of our being a human on this planet at this time, and it helps us find our functional fit within the Whole of I Am. At your very essence, who are you? Your answer begins with the phrase I Am, and in a word or two, describes how you feel when indulging in your highest-imaginable state of being. Without leading you, I will just say that others have answered with such statements as these: “I Am happy/joyful”, “I Am peaceful/safe”, “I Am purposefully creative”, “I Am adventurous”, or “I belong”, etc. These are mere examples and are not meant as suggestions; your own answer will feel absolutely right for you. You may get chills or feel flooded with emotions when describing your higher Self, your Soul/sol/sun/Son/Christ-Self/your guiding light. Connecting to your I Am pulls on your heart-strings; you may even begin to sob! What a wonderful confirmation that you have deeply engaged the truth of your being. Please write down your I Am statement, and highlight it, encircle it, put stars around it or otherwise decorate it so that it is beautiful to display in a visible place. We have visualized ourselves operating in our highest capacity, fulfilling our unique purpose. Just as we witnessed, the perfect circumstances for the full expression of our Soul’s purpose are real on one level already and available to be realized on our personal level now. There is no withholding of our true potentiality; it is not conditional upon our worthiness. The fulfillment of our higher purpose awaits us already in potentiality; it is conditional only upon our own readiness. Now that we got a peek at who we are, at both our highest and deepest levels, it is up to us to establish receptivity for a life of increased freedom and fluidity. Compare and contrast your grand visualization with your original I Want list, made in Step One. Are there similarities? Are there differences? Are there surprises? Encapsulate your perfect scenario in a brief written narrative, in two or three sentences, using words that intentionally evoke the emotional significance of your envisioned experience. Your narrative should be resonant with your deepest values and congruent with your highest vision. There is no question that if we are who we are — unique beings, each with a creative calling — that we Can have, be, and do all that appropriately actualizes our fulfillment. Therefore, our original I Want list has evolved into a written narrative to be entitled I Can. Our Soul is always calling us. To hear it and not wave it off, we must first inactivate inhibitors we may have been unconsciously reinforcing from stories about ourselves that we have unwittingly adopted, or accepted by osmosis. Only when we uproot the storied-self that has us living in limitation can we establish new strategies with the potential to fulfill our soul’s purpose. To have the life we know we Can have, we Need our new I Can narrative to replace our old prohibitive story. This narrative becomes our new story, in which we are joyfully operating at our fullest capacity and in accordance with our newly discovered I Am reality. Check out the Aside: Our Storied Selves. As long as our old automated story motivates us, it hijacks our I Can capacities/skills/talents, etc., pulling them backwards to serve the deficiencies of our storied-self. In such cases, we use many resources to maintain the tale that had been implanted within us without our conscious consent. Our subversive stories have an incessant gravitational pull, which we must overcome. This is easier said than done. See this important Aside: Systemic Reorientation. Natural laws link our psychology, neurology and chemistry. Employ them with awareness to activate a whole-body transformation! Our decorated I Am statement is an easy chant that captures the emotional essence of our vivid vision and succinct new I Can narrative. When this audio-visual becomes associated with specific body chemistry, positive anticipation releases into the body a dose of the neurotransmitter, dopamine, easing us into euphoria. With our psychology, chemistry and neurology all linked we have the advantage of a wholistic expectation of elevation and evolution. Our old storied-self was never our highest self; this is now obvious. We finally have the opportunity to consciously replace our obsolete story, which was imposed upon us without our awareness or consent. What practices help us overwrite the new story over the old? To psychologically evoke our I Can capacities and confidently align our behaviors with our soul’s purpose, we touch our trigger-spot or elevate our vibrational resonance by reciting our I Am statement. We consciously reclaim our power — taking back the reigns from the stories that stymie us. Instead, we give the reigns to our higher self, which pulls us onward and upward toward the fulfillment of our destiny. “Let go and let God” and “let thy will, not mine, be done” are phrases that eloquently describe this reorientation. Afterwards, whenever we catch ourselves obeying our old story-line, we empower ourselves by declaring our I Am statement and using our established touch-trigger to stimulate a higher-frequency vibration, which renders our old storied-self defunct and is actively conducive to purposeful behaviors. Our Needs are always given priority resources. Needs defy unaligned Wants; therefore, we Need our new I Can story to occupy the default position in our psyche. Once our new story is automated, all else, including outward appearances, falls in line. Now, write a new heading, I Need. Under it we have a place to remind ourselves of the practices which will install our I Can narrative as our new empowered story. We Need to frequently recite our I Am statement and re-sight our I Can vision. These actions are not one-and-done. They must become habitual so their reactions can be fully automated. With practice over time, our I Am statement and/or our touch-point will trigger the same flood of feelings we had during our powerful I Can visualization. Thus, our story becomes a highly emotive pattern that will instantly elevate the energies of our entwined psyche and soma and put us in alignment with our soul’s purpose. Ultimately, we Can do nothing else but live the life we are called to live. Our I Can potentiality must reach its fruition; although, we must not fool ourselves into thinking our perfect life will spontaneously arrive, without our taking appropriate actions. The good news is: when our Soul’s story is installed and automated we will Want to respond to its calling. A congruency of purpose sustains our integrity, aligning our actions with our souls’ goals. Our positive attitude and our sensory receptors engage our right-brain; however, to bridge the gap between our current reality and our forthcoming reality we must get down to business, and that will require some left-brain organization. We intentionally organize our days so that we take all the transformative steps required to go from our present involuntarily-storied reality all the way to our new I Can reality. Someone says, I Am an artist. His/her envisioned I Can story is the Primary goal. Remember, the I Can story is not what we Want, it is what we know absolutely we Can expect if we are who we are, in this case, an artist. Primary Goal: I Can travel and paint lovely landscapes that are admired by many people who eagerly purchase them for a fair price, allowing me to earn a good living doing what I love. Our Primary goals direct us to actionable steps which span the difference between our current reality and our I Can story. Generally speaking, we take our Primary goal (from our I Can narrative) and break it into smaller and smaller goals, all hierarchically organized. S = Sensible, by both of the word’s definitions. Our action steps must be realistic and we must be able to literally sense when each is accomplished. Especially good if completion produces a measurable outcome. P = Positive. Our actions take us to a positive outcome; they do not merely negate a negative condition. A = Actionable. Each step involves taking an action to relieve the tension of deficiency (like getting water relieves thirst) and move toward the proficiency of our Soul-conducted life. R = Relevant. Every step is in alignment with our Soul’s reality, our new story. Each step overcomes old inhibitions and obstacles from our previous mentality. K = And, we must Know our ourselves as the I Am of our Soul’s purpose. Our souls SPARK no ordinary goals. Instead, they ignite in each of us an extraordinary goal, above and beyond the goals usually set for personal or professional purposes. Take classes in oil painting. Get new canvass and quality paint brushes. Acquire inspiring source materials for new paintings. Figure out how to price paintings. 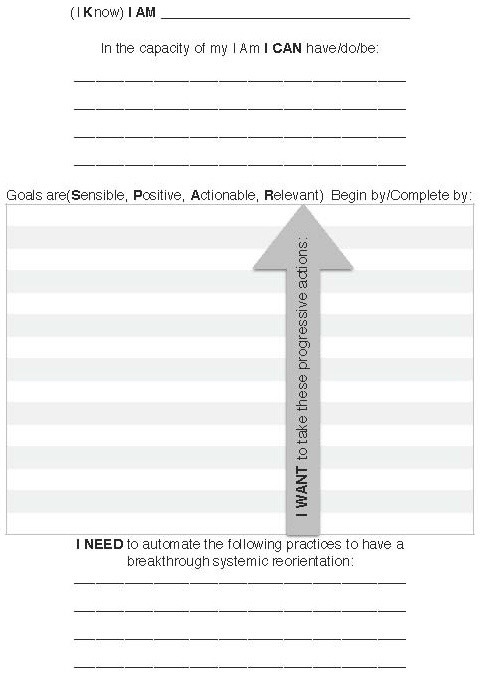 Each of these Secondary goals is written on a separate sheet of paper. Taking each sheet, we continue, one at a time, breaking down the Secondary goals into Tertiary goals. The following is an extremely simplistic version of an artist’s Secondary to Tertiary steps. Each is a step to which a deadline can be assigned. If Tertiary goals are still too broad for this, continue in outline form until reaching action steps than can be performed by a specific time. Sheet 1: Take classes in oil painting. Research dates, times and tuitions for art classes at community college, by such and such a date. Sheet 2: Get new canvass and quality paint brushes. Search online for best prices/values of art supplies, by such and such a date. Sheet 3: Acquire inspiring source materials for new paintings. Take photos of landscapes at local park, by such and such a date. Download and learn to use special effects photo apps, by such and such a date. Sheet 4: Figure out how to price paintings. Track artists on Etsy and other artists’ sites to see what size paintings are most in demand, by such and such a date. Determine what price range sells most often, by such and such a date. Every actionable step has been assigned a realistic deadline for completion. As we begin to wrap up the sixth and last step, we have an I Am statement, an I Can narrative, a list of time-sensitive actions steps that we Want to take, and some empowering practices that we Need in order to overwrite our old debilitating story. Compile the components above in the layout below, forming a success trajectory. For filling in the form at your convenience, click on layout to open it separately. Save the photo file on your desktop. Drag it into a document for resizing and printing. Use your browser’s back arrow to return here. List actionable steps, chronologically upwards from bottom to top in the I Want section of your printed form, or some version of it that you make for yourself. In other words, the sequenced steps create a written timeline that spans from your current reality up to the achievement of your I Can narrative. For completion of goals listed to left of the arrow, we assign deadlines to right of the arrow, and from them deduce a realistic date for when we may be living our purposeful life. Schedule all actionable steps into your working calendar, from which daily activities are prioritized. As action steps are completed, enjoy the dopamine release from each item checked off your timeline! Before bedtime each night review your success trajectory. For any challenges or disappointments, ask your higher self to present a solution in a dream to be remembered upon waking. Our souls want us to achieve fulfillment, so help comes with every sincere request. The process shared here is progressive. It is made to be repeated each time we feel called to shed subtler and subtler limitations. With every round our stories fade and our creative license expands. At some point, when we ask ourselves who we are, we will say, I Am…, and no other descriptors will follow. Having played out our stories successfully, we will find ourselves storyless. The I Am of our unique soul will have merged into the I Am Self of all. Our I am has become THE I Am. At such a time, we simply ARE, as the entirety IS, the Eternal Comprehensive Perfection. The final truth is that we are what we are, Oneness, unfettered and un-storied. After covering this material (as many other live presentations before) – decided to take a progressive step and do the exercises… Although they reminded me of EST / Landmark Education principles of Werner Erhard, when I went deeper into the specificity of the exercises crowned by a One-on-One meeting with the author, I can only share that I was intrinsically touched and moved by Devi’s genuine, deep and emotional support. Thank you, Devi!